OIG are specialists in landscape design and implementation. 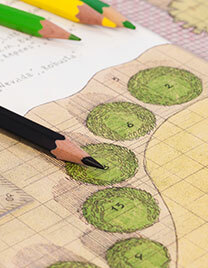 Our design architects will use computer aided design to create plans for layout and planting of gardens and landscapes. We have extensive experience in providing solutions to hotels, hospitals, corporate and government as well as building and designing recreational grounds (football, hockey and rugby pitches) in Oman. With our expert knowledge and experience of plants and local conditions we will then implement the bespoke designs for your organisation. Once gardens and parks are established, professional maintenance is essential. Irrigation is necessary and automated watering systems can be installed; tree maintenance may also be required – this might include planting, trimming and disposing of green waste. OIG are able to provide an ongoing and dedicated labour force which ensures that landscapes and gardens always look good. In addition, OIG has its own nurseries where a wide variety of seasonal plants and trees are available for both indoor and outdoor use as well as a comprehensive selection of garden materials.